Posted 3 years ago on Friday, June 17th, 2016 by James S.
I like to go mountain biking. Previously, I had been using my truck to transport my bike. This works, except it meant on a nice day when I wanted to bike ride, I had to leave my fuel-efficient convertible in the garage and take my F-150. This didn’t make a whole lot of sense. 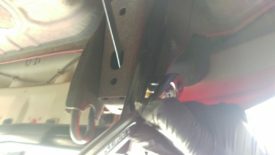 Fortunately, Miata hitch installation is very easy, solving my problem. To go with the hitch, I installed a Swagman XC2 , the cheapest tray-style bike rack I could find. 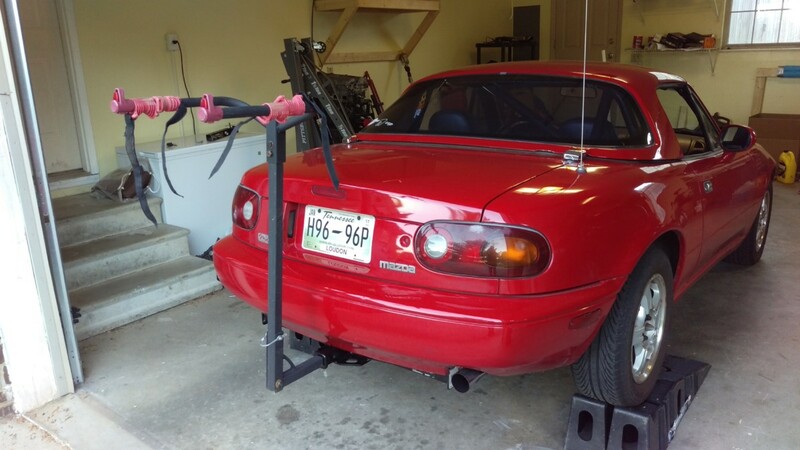 I had a cheap Harbor Freight one that hangs the bike by the top of the frame, but I found the bike was lifting up behind the miata on the highway, and I didn’t trust the cheap velcro to hold it on. Other people use trunk racks for this. I find hitch racks are easier to take off when not in use, keep the trunk free, I can use the same rack on any car with a receiver, and don’t scratch my paint. 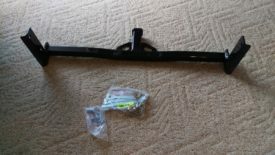 I ended up going ahead and getting a class I 1-1/4″ hitch receiver for the car. Miatas aren’t exactly tow vehicles: in fact, Mazda doesn’t rate the Miata to tow anything. However, thanks to demand from folks with bike racks and tire trailers, there are plenty of options. Almost all of them mount to the tow hook area behind the bumper. Some of them are more hidden than others – mine, in particular, is very visible. 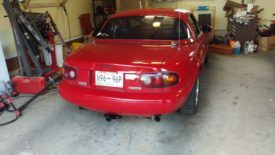 Flyin Miata and Bethania Garage both sell hidden hitch receivers that are very lightweight. Flyin Miata’s hitch in particular is extremely light at 5 lbs. 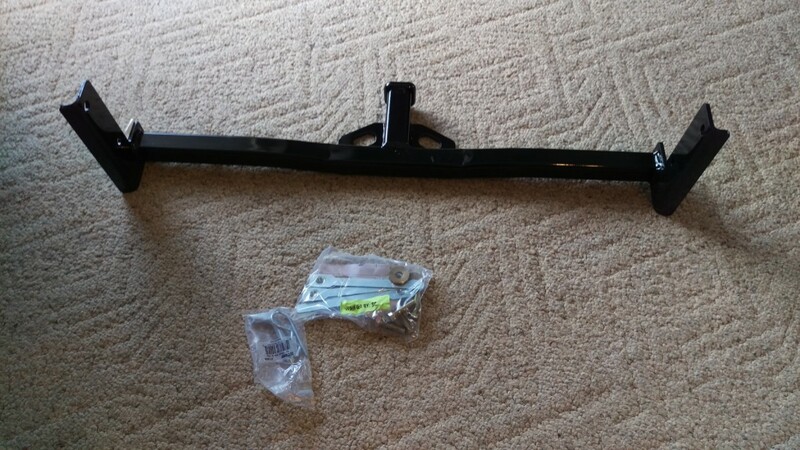 The Curt hitch is 15 pounds in contrast, although I don’t lose sleep over weight in such an already-light car. Personally, I also had an Amazon gift card to spend, so the fact that that could pay for the Curt helped as well. From the reviews, any of the available options work quite well. 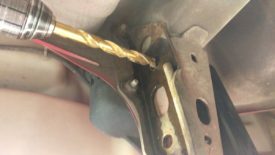 All of the Miata hitches I have seen follow the same basic pattern. They’re really a simple crossbar with a 1-1/4″ receiver welded to it. The ends of the crossbar bolt in two places to the rear tow hook mounting areas that are part of the subframe. 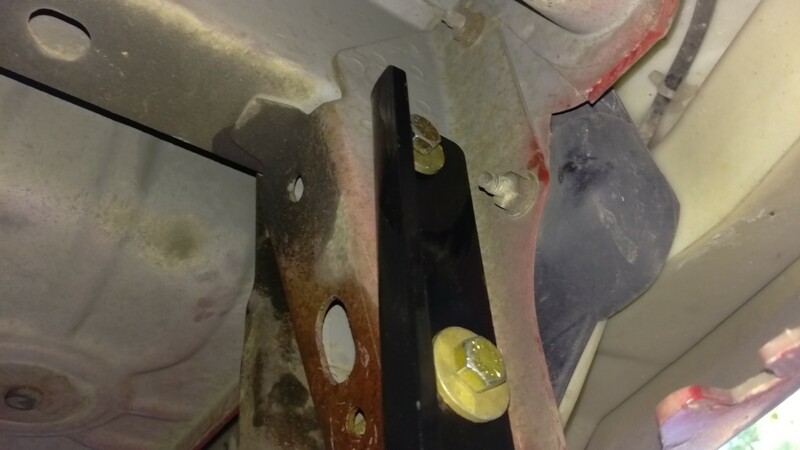 This gives the hitch a very solid mounting point. The hitch installs with 4 bolts in the location shown. 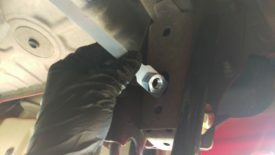 There are two ways to do the install of this particular hitch, and I highly recommend the second way. 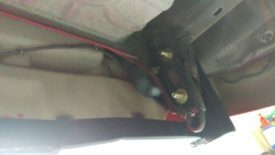 The way Curt intends for you to install the hitch is to use these 4 strap nut things. I’m not sure what they’re real name is. They’re a bit of aluminum with a nut loosely welded on the end. 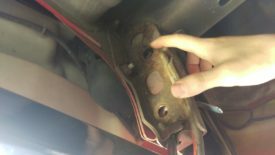 The idea is that you stick them in the rear tow hook support bracket as shown, put the bolt in from the outside, and tighten it up. So many problems here. For one thing, getting this lined up and threaded in is extremely annoying, especially for the upper bolts. If you manage that, the strap itself will curl up as you try to tighten. There is not nearly enough resistance to properly torque the bolt. And all of this is done to avoid drilling through the other side, which is what I ended up doing. 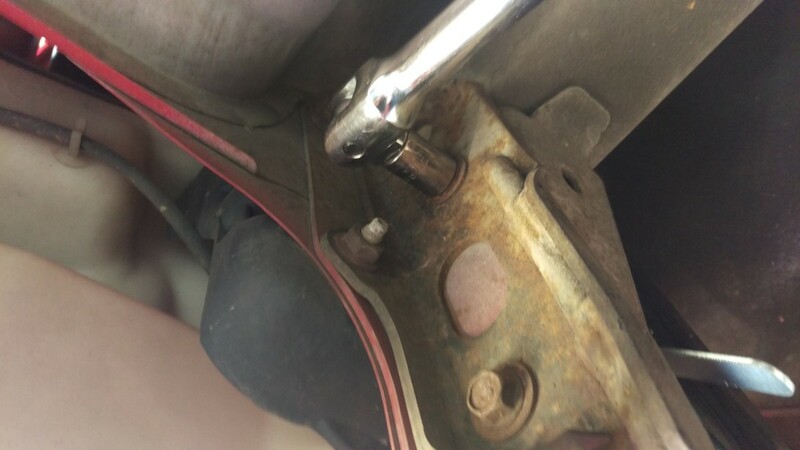 The holes used by the four hitch bolts exactly match the tow hook bolts on the other side. Thus, it’s a whole lot easier to simply drill the tow hook bolt holes out a little larger, and run a big grade 8 bolt through the whole mess. 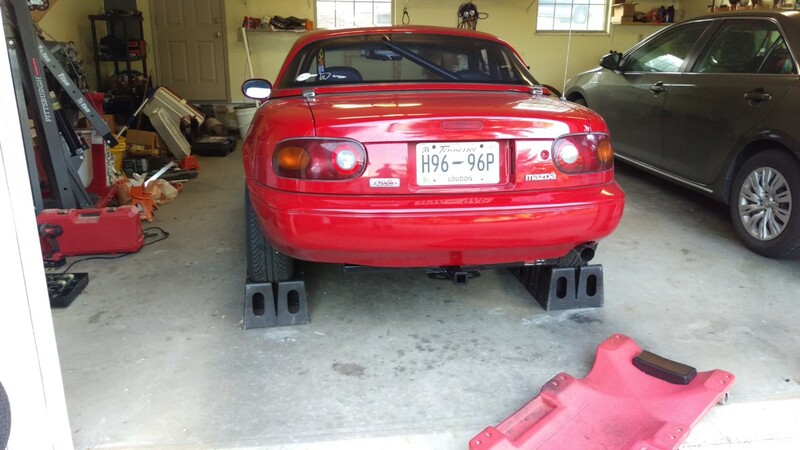 To do this, start by undoing the rear tow hooks. You can even re-install these if you’d like afterwards. Here are the two bolt holes to be drilled out. I simply drilled from the inside. 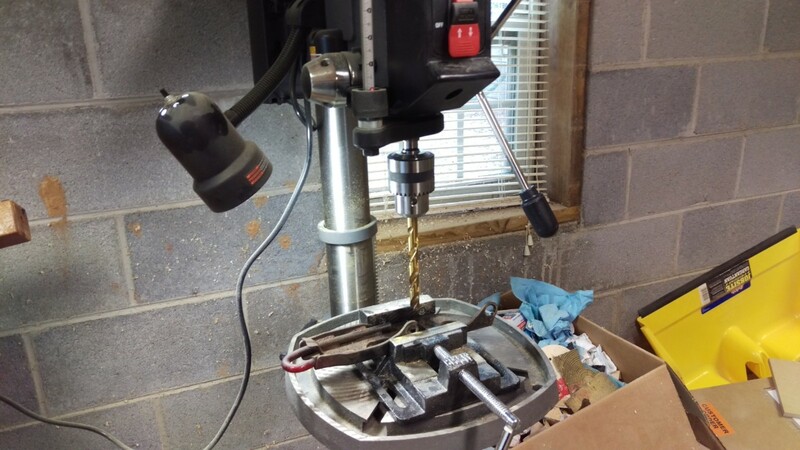 The bolts were 7/16″ – highly recommend using a cobalt or titanium metal bit for this. 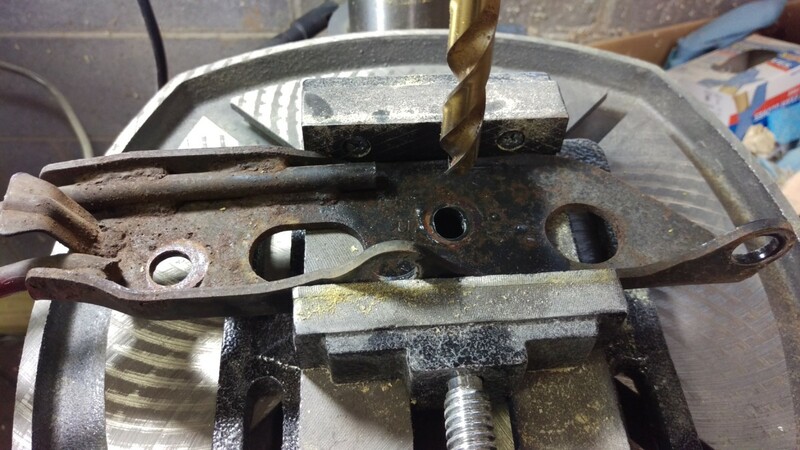 Using high speed steel to drill steel takes awhile and wears the bits out. Also, as always with drilling metal, put some kind of lubricant down to keep it cool. You’ll notice that I left the tow hooks on as I drilled. This was intended to keep them lined up properly, but it didn’t quite work as noted below. 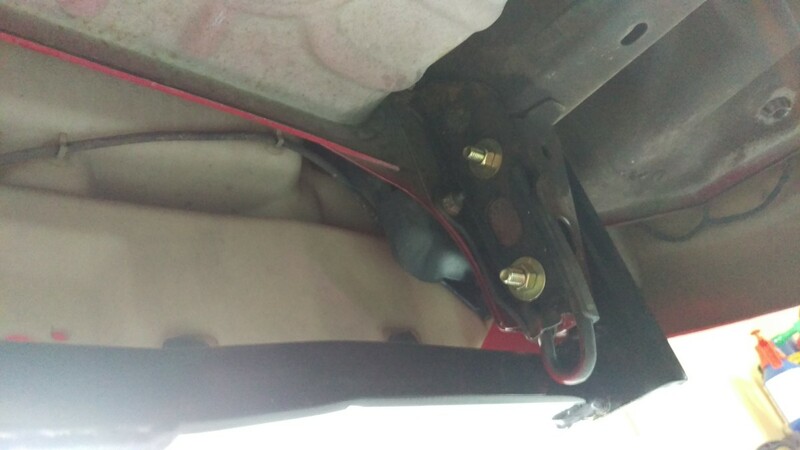 If you don’t want keep your tow hooks, ignore this step. 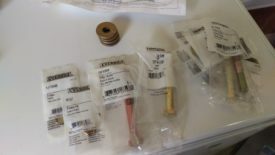 Obviously, the bolts and nuts that came with the hitch won’t be long enough, so you need to take a trip to the hardware store and grab a few grade 8 bolts and nuts in the same diameter, but longer. The ones I got are pictured. Grade 8 might be overkill, but it sure won’t hurt. 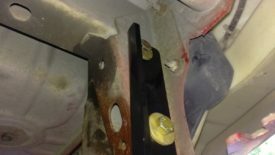 The washers need a flat spot ground into them to fit flush, otherwise they will hold the bolt off of the bracket. 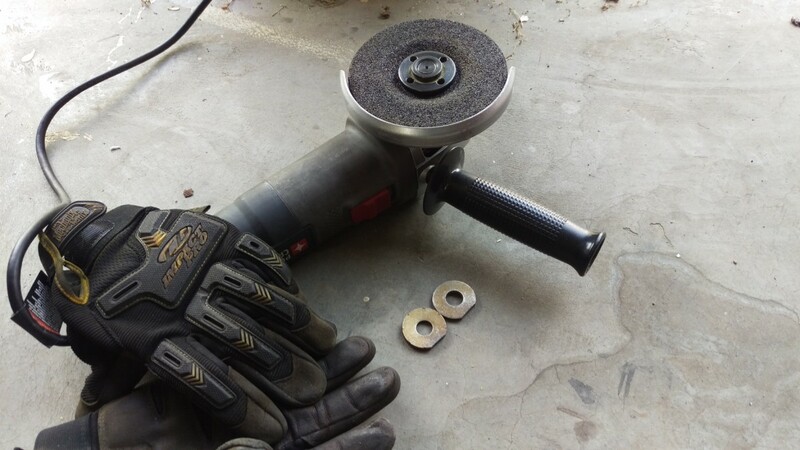 This is quick and painless with an angle grinder, although you could also use a dremel in a pinch. Once this is done, you’re ready to bolt it up, unless you want to keep the tow hooks. If you do, skip down to the next section. Once that’s all wrapped, you can run the bolt through the whole, washers on both ends. 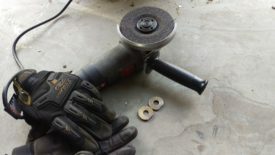 This allows you to torque it down properly and easily remove it later if desired. 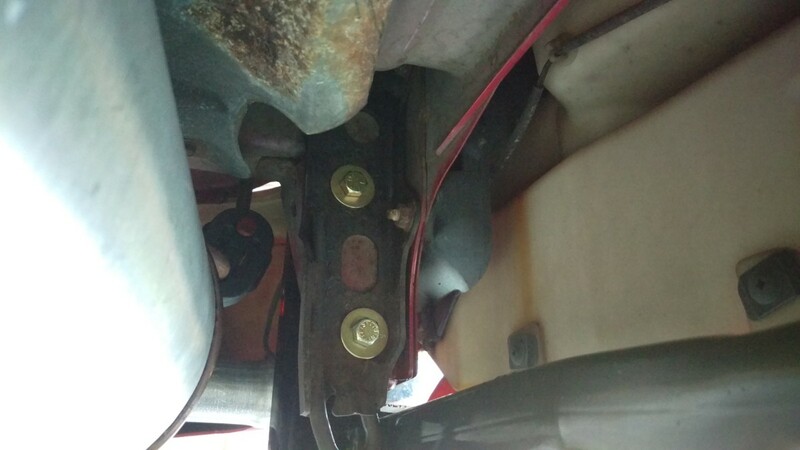 If you wanted to revert to just the the tow hooks, you can leave the grade 8 bolts in place as they are. 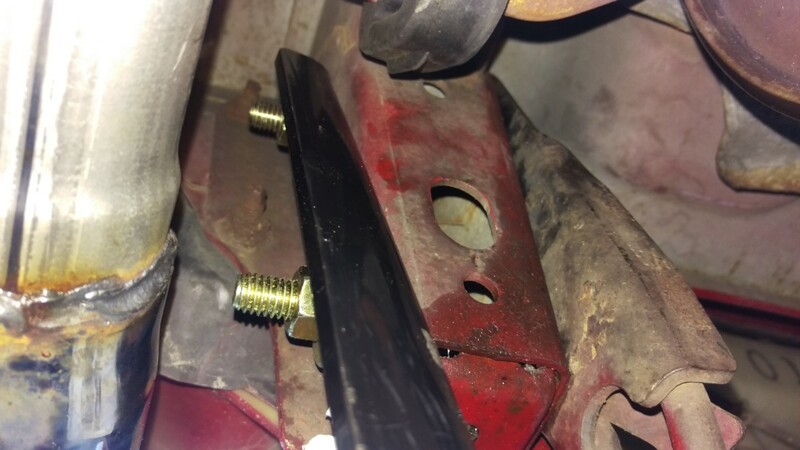 If you don’t want your rear tow hooks, you can just put them on a shelf or chuck them in the garbage. 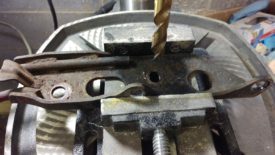 If you’d like to keep them, I found that they need to be drilled out to a slightly larger size, such as 1/2″, to line up with the bolt easily.. 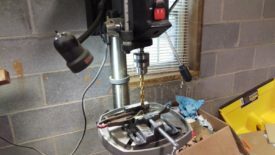 I did this on my drill press, although you could probably do it with a hand drill, just not as easily. In all, I’m happy with this product . If I hadn’t had Amazon dollars to spend, I may have wanted to look into a hidden hitch system or a lighter-weight option, since they’re only $50 more expensive or so. That said, this has otherwise worked perfectly. I’m able to go mountain biking without having to waste as much gas, and the Miata handles it just fine. The only note on that I have is that for whatever reason, perhaps because of the low profile of the Miata, the style of bike rack shown tends to make the bike lift up at the bottom going down the highway. It stayed on, but this prompted me to upgrade from the crappy $40 Harbor Freight bike rack pictured, which I had bought five or six years ago. I went with a Swagman XC2 , which is one of the cheaper tray-style bike racks. This totally fixes that issue. My biggest regret with this hitch is how far it sticks under the car, because the hitch now scrapes then I load the car on my trailer for track day. On the plus side, it guards my actual bumper from scraping, and the underside of the hitch can be touched up with spraypaint very easily. 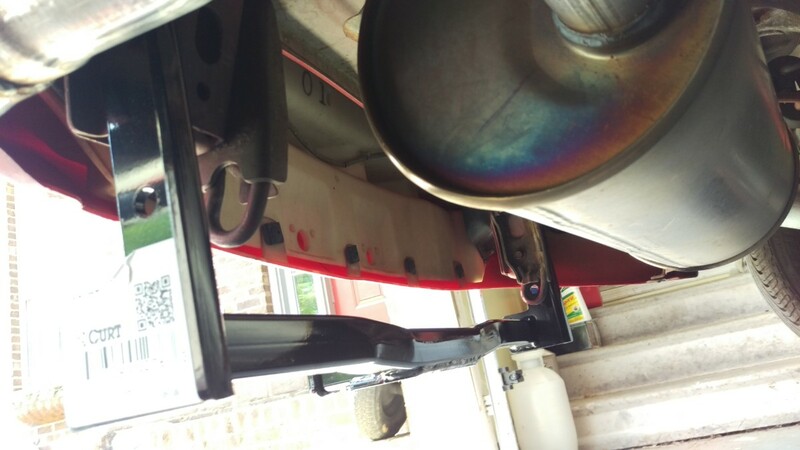 An additional bonus is that I find lifting the rear of the car by this hitch to be very easy, as opposed to trying to get my floor jack to the differential, where there’s not much room.